I occasionally get asked if plans are available for some of the projects I've built. The answer is...sort of. Before beginning a project for a client I almost always draw something up, but more times than not it's just enough of a sketch to convey what the final product will look like. I might include a few dimensions here and there, but given how fluid the design/build process can be, the end result is usually slightly different than what the original drawings indicated it would be. As a result, I have half-complete plans for most everything I've built. If enough people ask about plans for a given project, I can usually flesh out a complete set, or at least enough to convey the critical shapes, sizes and dimensions. Those plans will be available here. 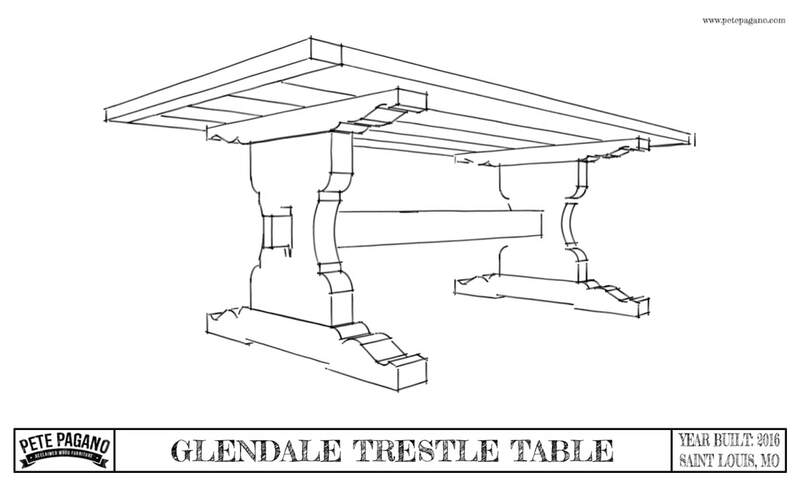 The Glendale was a trestle table I built for a client in, you guessed it, Glendale, MO. The existing house on their property had been built just after 1900; it was small, functionally obsolete, in need of a ton of work...but it also sat on a much-desired double lot. The clients demo'd the house and built a new one, but wanted to use some lumber from the original structure to build a table. This is that table. For the blog posts covering the build, click here, here, here, and/or here. The lumber used to build this reclaimed wood, counter height dining table came from an architecturally significant 19th century house, located on a street named "West Belle" in St. Louis, MO, that was being demo'd. I didn't score much lumber from that particular house before it got knocked over and buried, but I got enough to build a few items, including this table. For the blog posts covering the build, click here, here, and/or here. These bar stools have been a popular item, and I enjoy building them because they provide me with an opportunity to do a little welding. Similarly, there are a number of ways they can be finished: blackened steel, painted steel, clear-coated steel, etc., so there are a lot of options to choose from to yield a really custom item. 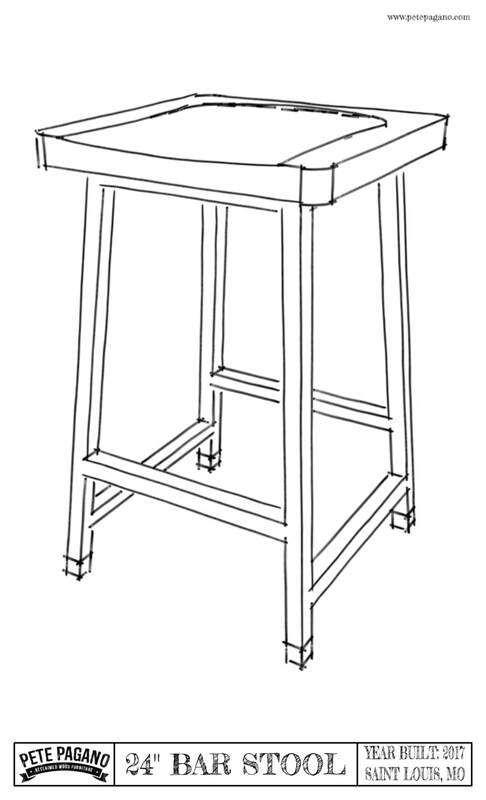 The drawings include dimensions for building a stool that stands 24" tall, although it'd be pretty easy to adjust the math to build shorter or taller stools. I make these things with 1" square steel tube, and seats/feet from wood reclaimed from 100+ year old houses. I usually run the wood grain in the seat front to back, which provides me with an opportunity to leave the raw edges - lots of character and patina - exposed and left alone on the sides of the seat. For the blog post and video covering the build of one of these items, click here.